I like eggs but I hate preparing them. This is my solution. Bake once and eat all week, or freeze for the future. You can eat these muffins as is or throw them into a tortilla for a quick breakfast wrap. And, if you like variety, change up your vegetable add-ins. * Here I diced mushrooms, bell peppers, onions and some fresh cilantro. 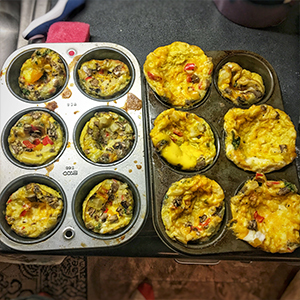 Spray 12 muffin tin cups with non-stick cooking spray. In a big bowl, crack eggs, add milk and wisk together. Fold all your vegetables into the egg mixture. Pour egg mixture into each of the muffin tins. Be sure not to overfill. I find filling the cups to 3/4 height works best (see the tin on the left). Once the muffins are completely cool, you can store them in an airtight container in the refrigerator for up to a week. Or you can wrap each muffin tightly in plastic wrap and then place in foil or bags and freeze for up to 3 months. Reheat baked egg cups in the microwave or in the toaster oven.